Congratulations go to Rafi Oakes who has been awarded the CMST Pupil of The Month Award for March, 2018. 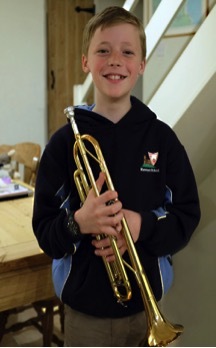 Rafi is a committed Trumpeter who has shown great development and a lot of this is due to fantastic support at home along with a structured rehearsal routine. He has also flourished as an ensemble member which, he says is a major contributing factor in helping his rapid progress. Rafi is taught by Claire Churcher, Brass Team Member, and she had some wonderful things to report on when being spoken to about the POTMA award.